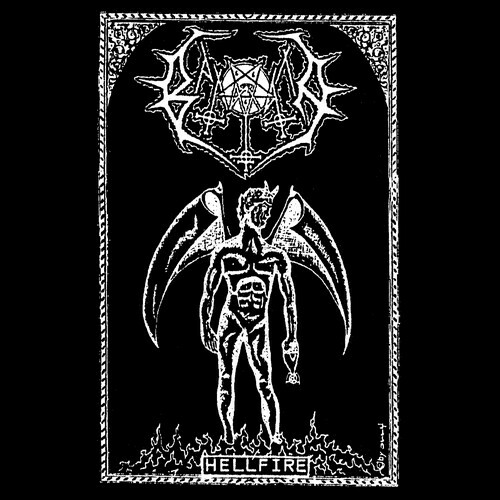 In 1992, Baxaxaxa released their only demo, called “Hellfire.” Originally released as a cassette in a very limited quantity, it was largely unknown until the Ungod/Baxaxaxa split release by Merciless Records in 2002. Baxaxaxa emerged as a side project of three other bands from the Bavarian region of Germany—Cabal, Fulgor, and Ungod—and is simultaneously both a synthesis of and a departure from those bands’ styles. 25 years later, few traces of the band’s history remain. The origin of Baxaxaxa was unremarkable. During a night of drinking in 1991, four members of the aforementioned bands (Condemptor – drums, Unholy Worshipper of Shub – guitars, Ancient Blasphemic Grave Invocator – guitars/vocals, and Skullcrusher – keyboards/vocals) decided they should embark on a side project with the intention of creating Black Metal that was aggressive and deeply rooted in tradition, but also steeped in atmosphere. The name Baxaxaxa was selected by guitarist Unholy Worshipper of Shub before the band’s first rehearsal and refers to a demon he found in a now-lost-and-forgotten book. The band’s logo was created by a Canadian tape trader with whom drummer Condemptor was connected, and the cover artwork was done by Infamist of Tumulus, the vocalist for Ungod at the time. Consisting of just four songs, the “Hellfire” demo constitutes the entire discography for the band. They wrote them over the course of several rehearsals in 1991-92 and recorded them during a live session in a friend’s basement studio (referred to as BSP Sound Studio). The recording was primarily to memorialize the work, as it was already understood at the time of the recording that it would be end of Baxaxaxa, each member being more deeply focused on his other projects. Considering when they were written, the four songs on this demo represent an inflection point for Black Metal toward a slower, more melancholy sound and the incorporation of keyboards. Baxaxaxa’s sound clearly bears the influence of seminal bands like Bathory and Masters Hammer, but also that of emerging contemporaries like Rotting Christ and The Gathering. “Church of the Antichrist,” the keyboard-laden opening track, establishes the environment into which the rest of the demo settles. The core of the song is assertive, mid-paced Black Metal, sinister and haunting and encircled by melodious keyboards that give the track a mournful quality. 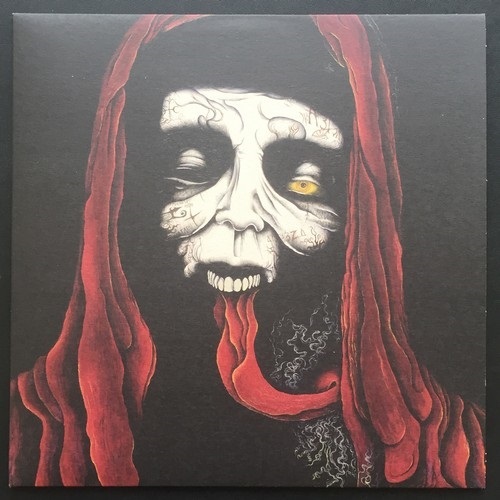 Only the second track, “Nocturnal Mass and Christ’s Damnation,” is unadorned by keyboards, but it’s also the band’s most frenetic track and the boldest display of traditional Black Metal on “Hellfire.” The last two songs inhabit the same darkened mystical space as the first, featuring moribund riffs accentuated by keyboards. Repetition is central to the effect of these songs; riffs and passages are drawn out and ritualized, amplifying their aura. Although Baxaxaxa only recorded this single demo, looking back, one observes not only the superb nature of the songwriting, but also how significant and ahead of its time it was. For that reason, this recording, too seldom given the attention it deserves, needs to be revisited and reconsidered. To that end, NWN! is honored to present this definitive edition, released for the first time as a proper 45 RPM 12” EP. Reprint with the logo, title and cross in red. 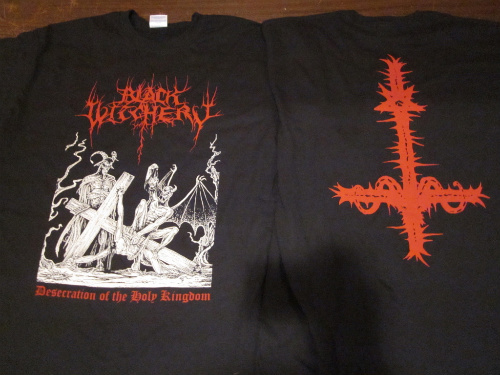 All discharge ink printed on Gildan brand T shirts. Available in sizes S to XXL. Click here to order.